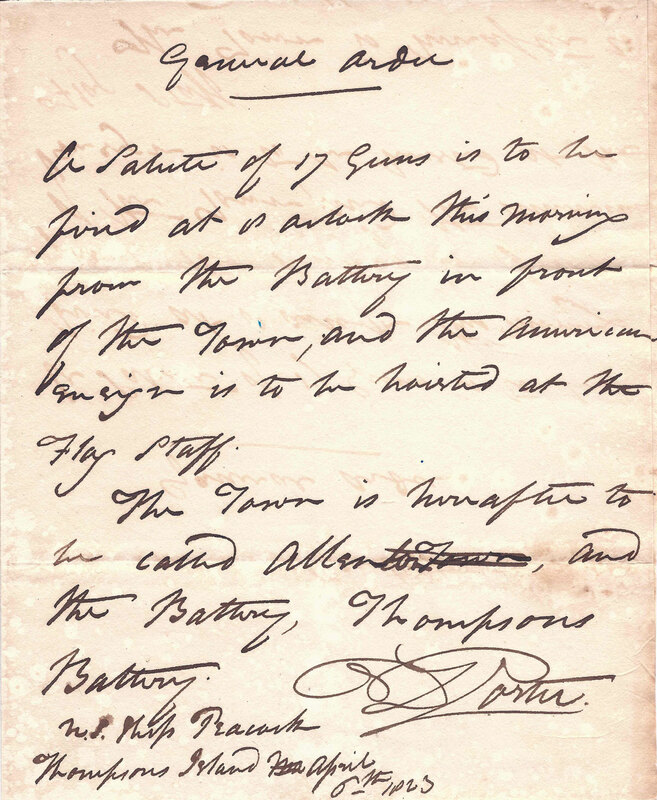 A General Order to raise the American flag over the island of Key West, issued by Commodore David Porter on April 6, 1823. 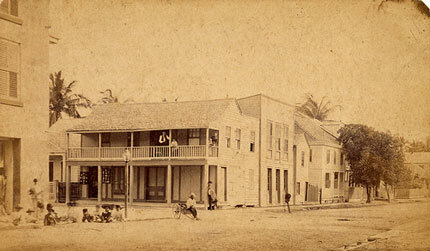 From the Scott De Wolfe Collection, Monroe County Public Library, Key West. Click for original document. The Monroe County Public Library in Key West is the new owner of a major historical collection following a ceremony this morning in the Florida Keys History Room. Local dignitaries including City of Key West Mayor Craig Cates and Monroe County Mayor Pro-Tem Heather Carruthers attended along with representatives of cultural organizations and members of the media as the Key West Maritime Historical Society officially presented the Scott De Wolfe Collection—amassed by the obsessive Maine collector during the past fifteen years and recently purchased by an anonymous donor—as an outright gift to the library for the benefit of the public. The De Wolfe Collection—seven boxes containing thousands of documents dating to Key West’s earliest history—is considered by local historians to hold some of the island city’s most important historical records. Among them are the 1823 letter (reproduced at top) from Commodore David Porter of the United States Navy. Called “Key West’s Magna Carta” by local librarian Nancy Klingener, the letter orders a seventeen-gun salute and the raising of the American flag over “Allenton,” which was Porter’s preferred name for what had previously been known as Thompson’s Island, and which is now much better and more suitably known as Key West. Photo of Wall Street from above, showing the W.H. Wall and Company Building and, in the background, Front Street’s Louvre Hotel. Circa 1865. The collection includes historically significant items ranging from nineteenth-century street scenes and stereoscopes to early color postcards and cigar-box labels to court transcripts from the trial of legendary Key West Fire-Chief-crook Joseph “Bum” Farto. Announcement was also made this morning that Monroe County will fund the creation of a new Archivist position at the library to ensure for the correct care and cataloging of this and other important library resources. Scroll down for selected images from the collection and click to link to full-size versions or go to flickr to browse the Scott De Wolfe Collection at the Monroe County Public Library, Key West. R. M. Roberts of 1606 Pierce Street with two unknown persons. 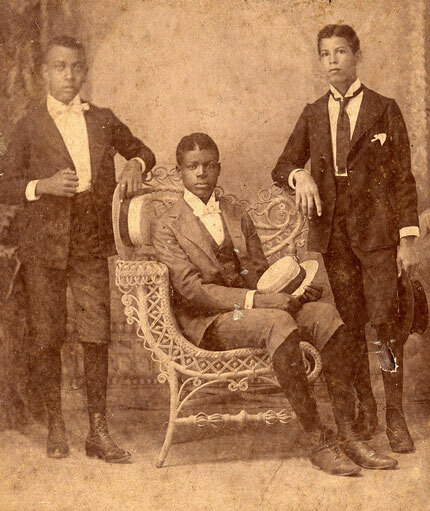 Photo by Burgert Brothers, circa 1900. 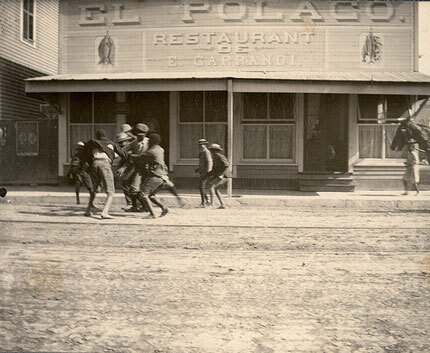 A street scuffle in front of the El Polaco restaurant, circa 1900. “El Polaco” was the nickname for Carlos Roloff Mialofsky, the popular Polish-Jewish hero of the Cuban Ten Years War and War for Cuban Independence. The busy corner of Duval and Greene streets showing Abraham and Isaac Wolkowsky’s men’s clothing shop, Johnson’s Jewelers, and the Louvre Hotel, circa 1915. The Moffat photography studio at 227 White Street, circa 1870. 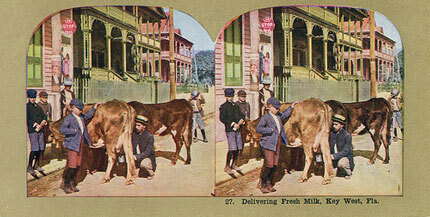 Color stereoview of fresh milk being delivered in Key West. 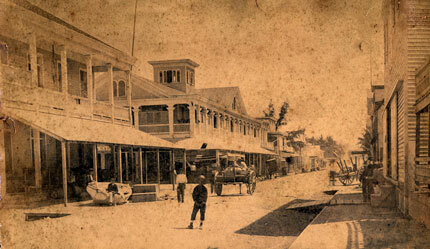 Near the corner of Duval and Front Streets, 1880s. 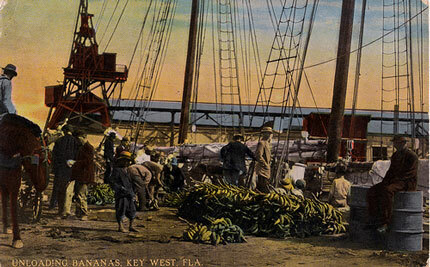 Color postcard, mailed in 1913, showing a shipment of bananas being unloaded at the Key West waterfront. 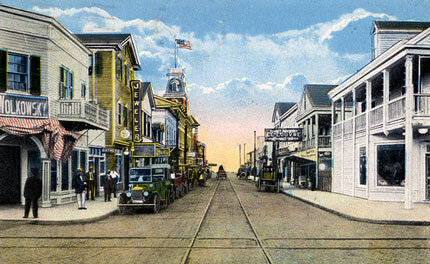 The above post card circa 1915– How can that be Duval and Greene streets unless they moved City Hall to the other side of the street? Perhaps the corner of Simonton and Greene? Hi Michael– It’s looking North down Duval toward the Gulf. That building you see with the tower and the American flag is the Jefferson Hotel (earlier known as the Hotel Key West) near the corner of Front St. City Hall would be to the right at the intersection in the foreground, up Greene St.